This GREAT STEREO portable Panasonic AC/DC Cassette Tape Recorder AM/FM Radio TWO Speed Phonograph is great for any type of indoor or outdoor activity. The sliding hidden quality phonograph and AM/FM Radio and Cassette Recorder operates on either on 4 "D" cell batteries (not included) or by 110 volts or can even be used in your car with an optional DC car cord. Of course the AC power cord is included. This is a wonderful portable STEREO Two Speaker Panasonic that can play and record cassettes, play records in 33 or 45 RPM, or tune in AM/FM radio and still is small and portable enough to be taken to the beach or anywhere. 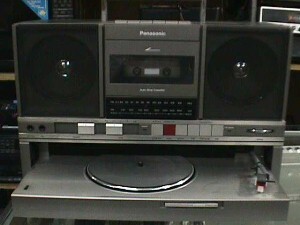 A high quality Panasonic portable with a unique Phono-in-Drawer TWO-Speed Record Player Cassette Recorder and AM/FM Radio - this a great looking, great sounding, and great working momento of the 1960's and 70's that should carry you well into the 2000s. BRAND NEW IN ITS ORIGINAL BOX!! !